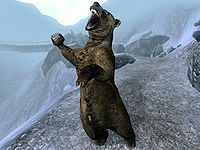 This sandbox is currently being used to create a Oblivion:Bear and a Oblivion:Skeleton page. 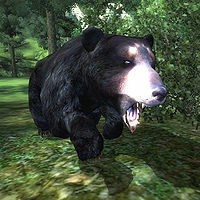 Black Bears are large, vicious predators that are encountered starting at level 9. This variant of bear is significantly smaller than it's counterpart, the Brown Bear. They are of black color with a light snout, as is seen in the image to the right. They are generally found in the thick forest regions of the Great Forest, the Weast Weald and the Colovian Highlands. Brown Bears are much larger than Black Bears and are much stronger. As a result, they are encountered at higher levels starting at level 16. Brown Bears are a relatively light brown, with the lighter fur beginning to appear around the neck area. They are generally encountered in the high altitude regions of northern Cyrodiil, known as the Jerall Mountains and Valus Mountains. Apart from their natural outdoor habitats, both variants are found in ruins and caves, as part of the standard animal and mixed leveled lists. Both will be found two levels earlier as boss-level creatures, along roads and in the exterior of Fort Caractacus. Bears have two main types of attack which include biting with their large teeth, or standing up on their hind legs and thumping any threat with the sharp claws on their paws. While they are not terribly fast, it is recommended not to get too close to these ferocious predators as any encounter can be potentially deadly for any who pose a threat. While being attacked, there is a 10% chance of being infected with the harmful Yellow Tick disease. 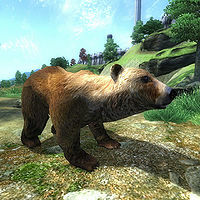 If the Knights of the Nine official plug-in has been installed, wearing the Boots of the Crusader will make all naturally found bears except West Weald Bears non-hostile to the player. This is especially helpful in the lower levels of the game, when bears still pose a serious threat. Note: Black Bears are the only type of animal that can be summoned. Usually only Spriggans have this ability, but the Spell Tomes official plug-in makes this spell available to the player. The Black Bear that is outside Fort Caractacus may be invisible. The reason for this is unknown. ? Skeletons are undead creatures which can be encountered at any level. They are often found within both the interiors and exteriors of Ayleid ruins, abandoned forts and caves. Skeletons can also be summoned by necromancers and even the player. 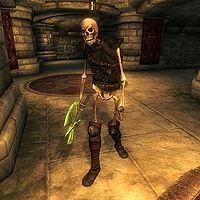 Like all enemies, the lower-level variants of skeletons have a significantly lower health rating. However, all variants are fully resistant to poison and paralysis. They also have a 70% resistance to frost and a permanent water breathing ability. 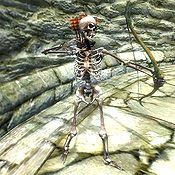 Skeletons do not have the ability to wield magic, and thus come in only melee and archer varieties. You are twice as unlikely to encounter the archer variety than the more common melee fighters. 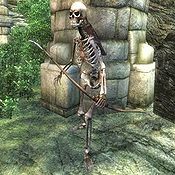 The majority of skeletons are encountered in ruins of some sort, either Ayleid ruins or forts. They most likely reside in these places because they were either killed guarding the area or were buried there. Skeletons are the undead remains of warriors past, evidently returned to unlife to finish some undone deed. All variants of skeletons drop bonemeal upon "death", apart from the versions summoned from the realms of Oblivion. 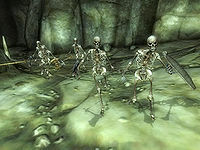 These skeletons are unable to be looted upon death, as they disappear immediately like all summonings. 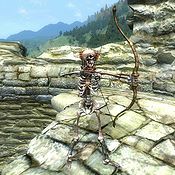 These low level variants of skeletons come in melee, archer and summoned forms. 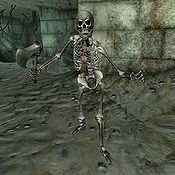 They are the first type of skeleton that is encountered in-game and have the lowest statistics. 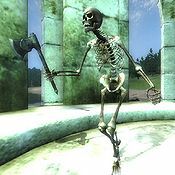 These variants of skeletons are the second variant encountered in Cyrodiil. They are slightly tougher in battle as they have higher health and stronger attacks. 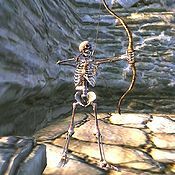 A Skeleton Hero is the third of four variants of Skeleton encountered in Cyrodiil. These skeletons have a higher health and attack rate than the Skeleton Guardian variants encountered. 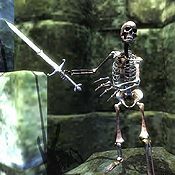 Skeleton Champions are the fourth and strongest variant of skeleton encountered in Cyrodiil. They are formidable foes in battle for the unprepared adventurer and should be approached with caution if poorly equipped. They are strong enough to wield a Claymore with one hand. ^aThis variant has an attack stat of 9 rather than 14. 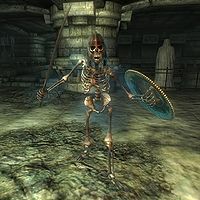 Unique Skeletons are skeletons that have different equipment and are only encountered in specific areas of the game. 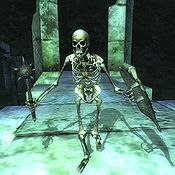 Dark Guardians are unique skeletons only found in the Cheydinhal Dark Brotherhood Sanctuary. There are only two in the game: one roaming the inside of the sanctuary, and one outside the entrance to it. 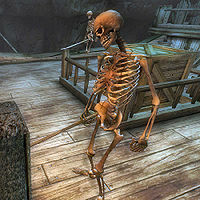 These skeletons are one of the two skeletons in the game that wear equipment, although it does not effect it's health. If a combat situation erupts in the sanctuary, the Dark Guardian will defend the Dark Brotherhood members with its life. ^bThese two varieties of Red Sabre Skeleton never appear in-game. They are part of a leveled list, but only the first version is ever actually used. Undead Blades are what's left of the Blades stationed in Sancre Tor. The Blades without Northwind and Mishaxhi's Cleaver, wield Ancient Akaviri Katanas, and all have an Ancient Blades Helmet equipped. Once killed, an ethereal form of their person (before they turned undead) will appear and thank you for freeing them. They will then make their way to the Tomb of the Reman Emperors. This page was last modified on 20 May 2018, at 06:57.